I’ve gotten completely sick of opening capsules of fish oil for the dogs. 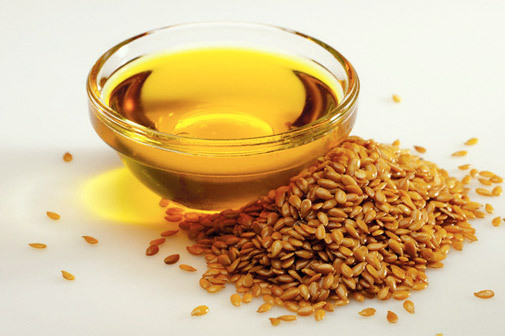 I take flax seed oil every day. Any reason not to give the dogs the same thing? Susan, dogs have a very hard time converting the flax oil components into usable nutrients; some people, like me, do too. The Omeaga 3’s are immediately available to them in the fish oi; for the flax oil, they must go through several stages of processing in order to convert to omega 3’s, and some dogs don’t convert at all. For their sake, much better to feed them good fish oil or salmon oil. Costco has a good brand of Salmon oil that I give to the dogs, and we take it, too. (Their fish oil contains soy oil, and I won’t use it for any living creature because all soy oil in the US is now GM (genetically modified) and can harm DNA – Europe has banned it.) Give them each a whole capsule, unpunctured, several times a week. I’ll bet they’ll eat it as is. (I squeeze two capsules over three Apso bowls every day, and drop the “empty” into two bowls each day. The “big guy” gets his own two capsules every day. Ken and I take two capsules each every day, too. You can never get too much Omega 3’s! >>> I’ve gotten completely sick of opening capsules of fish oil for the dogs. There are several brands of fish/salmon oil available in liquid form that can be dosed over food. I’m fortunate … I just throw the cap in the bowl and the little pigs happily chow it down. Personally, if you feed a good dog food there is no need to add anything to their diet. I have had dogs who cannot digest extra oil added to their food. Flaxseed is definitely one to stay away from. Thanks Julie. They definitely won’t be getting Flax Seed Oil. They have, however, been getting fish oil that I have been expressing out of capsules for a long time now, and I’m loathe to take them off of it. You might be right that they don’t need it, but I think I’m going to keep giving it to them for a while. Today I found some good quality (TwinLab) Cod Liver Oil (in a bottle) on sale at the local market, and I will try that. Tonight I did try giving them whole capsules (or rather I emptied half on one dish and gave the other half in the rest of the capsule to the other dog in that pair)…..to no avail. The capsules were politely rejected…. Dear Susan, please NO cod liver oil. It has toooo much Vit. A in it, and they don’t need it. And Twin Labs (and most other cod liver oils) now have only synthetic Vit A in them (they strip the “real” stuff out to use for other purposes and replace it with synthetic). Regardless, tooo much Vit. A for dogs. Cod liver oil is way different from plain ole fish oil. Just stick with plain Fish Oil, or Salmon Oil (there is a brand called Grizzley for dogs that I believe comes in a pump container and you just pump some on). For some reason, my little eager eaters chomp their capsules down with enthusiam. But I am still poking the capsules with a needle and squirting it on their food each morning…..to achieve correct doses for their weight. Sheesh….This is all just too complicated. Okay, I probably still have the receipt, so I’ll take this back tomorrow and go get that Grizzley’s Salmon oil (which I know I’ve seen at the feed store). OR I’ll just give up and go back to puncturing capsules. Heck, I have to go to Costco tomorrow anyway…..
Hemp oil is beneficial to both humans and pets. It’s a natural supplement to fight against arthritis. Good at stimulating growth of liver enzymes and works wonder for the coat. I should have bookmarked the link, but I’m sure you can find more info with a google search. I’m going with the Wild Salmon Oil from Costco. It means opening capsules, but I can live with that. I don’t understand at all how hemp oil could be good for dogs if flax oil is not, but I’ve already decided against the vegetable oils for the dogs. It really makes sense to me when I remember how short their digestive systems are compared to ours. We have the luxury of being able to break down grains and other complex carbohydrates; I’m not sure that dogs do. Ooops, I should have said I’ve decided against the “plant” oils. will be checking back soon. Please visit my web site as well and tell me your opinion.